The 2016 US Combine in LA has wrapped up. 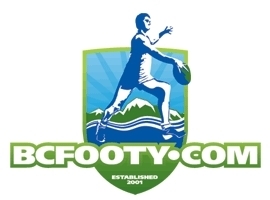 The AFL will now bring a number of athletes down to Australia in July (likely 3) to prepare for the National Draft Combine, although the possibility exists that they could bring one or more earlier at the request of AFL clubs as they did with Mason Cox in 2014. The final day of the Combine saw the athletes in a competitive, improvised game with tackling. Woody Quinn, a gridiron player from the University of Tennessee stood out here against the basketballers. Also impressing was the 7ft Frenchman Stan Heili who threw himself wholeheartedly into the competitive work. Others that impressed were Shane Henry and Omari Gudul. We spoke to Gil Griffin, author of the forthcoming book "Jumping at the Chance: From NBA Hopefuls to AFL Prospects — The Players of the American Experiment" who he thought would be offered the chance to come to Melbourne. This is not an 18 man team you would want to match up against. Okay they may be a bit top heavy. These 18 elite athletes are undergoing testing at the AFL's US Combine in Los Angeles Monday through Wednesday this week. And not all of them are American. The other nationalities include French, Nigerian and one athlete who is a citizen of The Democratic Republic of Congo. Most of them are basketballers (as their main college sport) with just two Janko Beras who is a baseball and gridiron football player and Daniel Joseph Woody Quinn who played baseball and volleyball in college. The full list is below, some of the stats may be out of date. 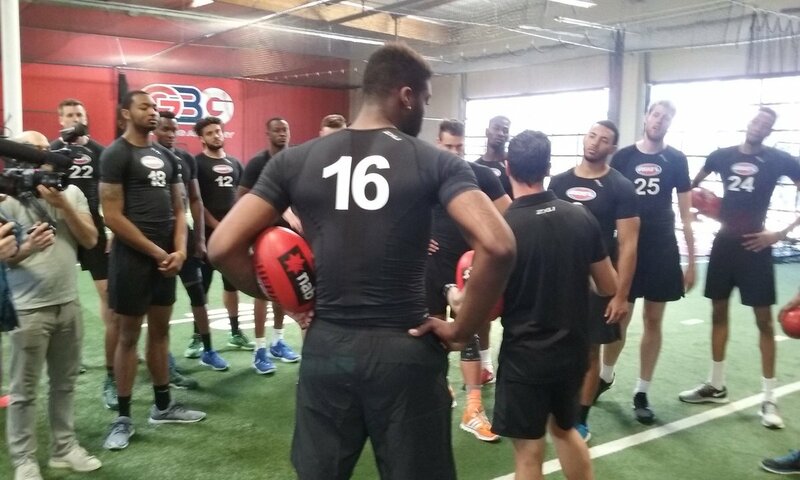 Three years ago it was Jason Holmes at the AFL’s US Combine that caught the eye of talent scouts at St Kilda and then subsequently locked him in at the National Draft Combine in Melbourne. 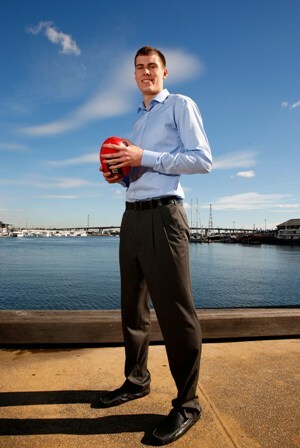 In 2014 Mason Cox made such an impact the AFL brought him to Melbourne early, where clubs made bids for his services. Collingwood won out and yesterday he made his memorable debut. Mason Cox was presented with his first Collingwood AFL jumper pre match today by Darcy Moore. It was a big jumper with the number 46 for the 211cm giant. The first presented to an American. The cold hard statistics lie sometimes. Other times they don’t. 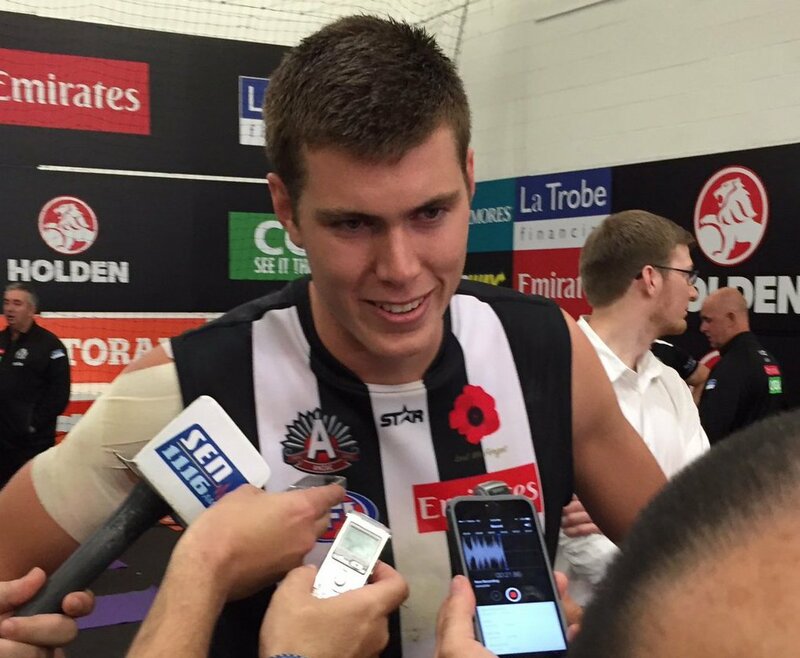 For Collingwood’s big Texan, Mason Cox, they tell an amazing story. On his AFL debut, on arguably the second biggest stage behind the AFL Grand Final, Cox played an admirable game. The stats say: 10 possessions (six kicks, four handpasses), 3 marks, 3 tackles, 11 hitouts 1 goal and 1 behind. Incredible given how short a time he has had in the Australian game. Where the stats do lie is in his impact beyond the stats. He kicked the opening goal of the match for Collingwood – the goal that opened the floodgates as the ‘Pies rampaged to a 69 point win over the Bombers. The celebration by Collingwood players (and supporters) after that goal showed such elation that it boosted their collective confidence immediately. They went on to win the ANZAC Day match 22 10 142 to 11 7 73 in front of 85 000 fans. 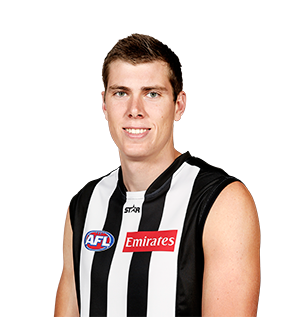 Last week Collingwood upgraded American Mason Cox to the senior list for the injured Matt Scharenberg. They then named him on an extended interchange bench for their match against Melbourne at the MCG last Sunday, but when the final 22 were named on Friday afternoon he did not make the cut. So it was another week in the VFL. He had 51 hit outs, kicked a goal, and had eight disposals and two marks. The Collingwood AFL side had another bad week on the field losing to Melbourne, taking their record to one win and three losses and the pressure was on. Coach Nathan Buckley said post match there would be changes. Early in the week the media speculation started. Cox's name was mentioned in press conferences, on panel shows and on the back page of Melbourne's leading footy newspaper The Herald Sun. When the 25-man team was named this evening Cox was again in there, this time named on the field, at full forward - replacing Jesse White who was dropped from the side. Just like last week we will have to wait for final confirmation, and extra day (4pm Saturday) but barring any extraordinary events we expect Mason will be named in the final 22 and will be running out as the first American to play in the AFL for the mighty colossus that is the Collingwood Football Club on Monday. Not just any day but the biggest day in AFL football outside of the finals series, ANZAC Day. 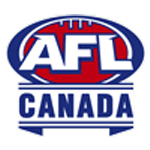 The 2016 Southern California Australian Football league will kick-off this weekend in Los Angeles. This year's league will feature two teams split from the LA Dragons team the Dragons Black (South Bay Outlaws) and Dragons Blue (Beachside Sharks), two teams split from the OC Bombers (OC White and OC Black) as well as Riverside and San Diego. Footy in southern California will be heating up but has been simmering away for weeks. San Diego has had three rounds of co-ed footy in February. And the men's National team the USA Revolution held their first camp of the year in L.A a few weeks ago with a number of local prospects attending hoping to win a spot and others providing an opposition squad of Aussie All-comers at the camp. Beyond this the obligatory pre-season sessions have all teams primed for a big start. BC Footy is thrilled to announce Burnaby lakes will host the Canadian nationals this year on May 21-22. The innaugural installment of the tournament will feature men's and women's teams from across Canada competing for national bragging rights. The Canadian Nationals will be a competition between provinces rather than clubs. Selection trials have already been carried out across Canada to determine selection of the men's and women's teams. British Columbia, Alberta, Ontario and Atlantic will be the competing teams - with the Atlantic team being made up of players from Ottawa, Montreal, Sherbrooke, Quebec City, Nova Scotia and Newfoundland. Portland is one of those teams that we haven't heard too much about. This year in the USAFL the Steelheads move from third to second division and are looking to maintain momemtum. Portland's womens team, the Sockeyes currently have 9 members and are looking for some external competition. Both the men and the women play in a four team metro league. They manage about a 9 game season with three 18-a-side games against the Seattle Grizzlies. The first hitout for the Portland Steelheads and Sockeyes on a Wednesday evening at Duniway Park saw a small but enthusiastic turnout. The location was conveniently across the freeway from downtown Portland but the weather threatened downpour as it did, if only moderately. And then there were two....Cox to debut? 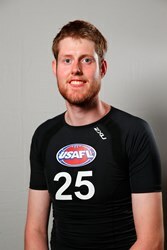 In 2015 it was the debut of Jason Holmes and now the second full graduate of the AFL's US Combines looks set to debut in the AFL for Collingwood. 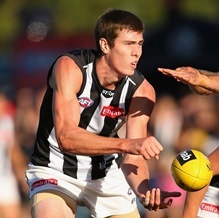 After Mason Cox attended the 2014 AFL Combine in Los Angeles the AFL couldn't rush him out here quick enough where he auditioned for a number of clubs and settled on Collingwood as his choice of club. Today Collingwood upgraded him to the senior list for the injured Matt Scharenberg. And tonight they have named him on an extended interchange bench for the match against Melbourne at the MCG on Sunday. There is no guarantee he will play in the final 22 and could have another week in the VFL.